One of the premier visual arts museums in the South, featuring a dramatic gallery building, a world-class collection and a center for special exhibitions plus a 164-acre Museum Park, the North Carolina Museum of Art (NCMA) in Raleigh, N.C., is also the spot for your next "heart-worthy" Instagram photo. We chatted with Emily Kowalski, communications specialist at NCMA, for her tips and tricks to capture the perfect &apos;gram. Thomas Sayre&apos;s Gyre is one of the most photographed pieces within the Museum Park, says Emily. The outdoor installation is comprised of three large-scale ellipses made of concrete, colored with iron oxide, reinforced with steel and mottled with pebble residue from on-site earth casting. NCMA&apos;s Iris and B. Gerald Cantor Court and Garden features 30 Rodin sculptures, making it the repository for the most extensive Rodin collection between Philadelphia and the West Coast. 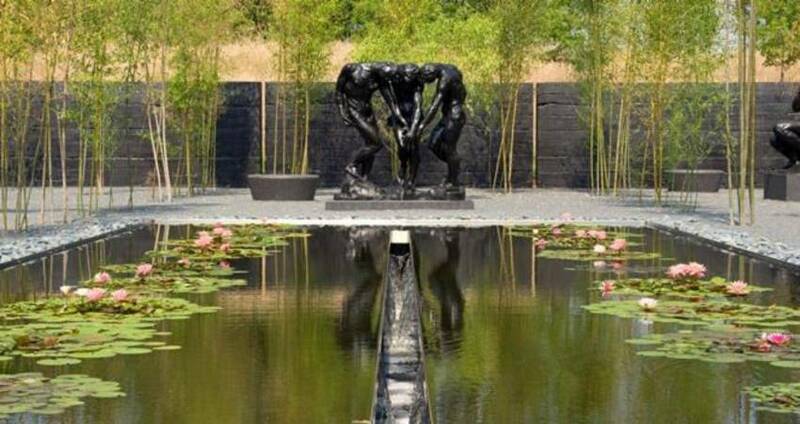 Featuring works from all phases of the master&apos;s career, you can snag a shot of the water lilies or of your friends posing like Rodin&apos;s statues. Floating above the main staircase in the East Building is Ralph Helmick and Stuart Schechter&apos;s Rabble, and you&apos;ve got a lot of angles to work with here. In this work, about 1,200 subtly-moving butterflies are massed together in the wedge-shape of a fighter jet. (Its title, Rabble, is the generic for a flock of butterflies or swarm of insects.) Focus on the butterflies or take a shot from a distance to capture the plane form. The Joseph M. Bryan, Jr., Theater in the Museum Park has welcomed some of America’s finest singer-songwriters and critically-acclaimed musical ensembles from around the world—and it&apos;s also a great location to try out a panoramic photo. Get your Instagram feed back to nature and spend an afternoon in the Museum Park, home to dozens of pieces created specifically for NCMA. Grab a spot under a weeping willow tree or scope out an installation or two. This supernatural tree is located in front of the West Building and was custom-made for NCMA using thousands of industrial pipes. Emily suggests capturing an image when it is cloudy to play off of the contrast between the silver tree and gray sky. Cloud Chamber for the Tree and Sky is an oversized camera obscura (a pinhole camera on the roof projects an inverted image of the sky onto the floor of the chamber, turning one’s perspective upside-down). Emily says that visitors often grab a shot of the shelter before realizing what lies inside. Spanning an entire wall in Iris, The Museum Restaurant, is a large, site-specific installation by Patrick Dougherty featuring branches and boughs from the surrounding area. Emily notes that the natural light of the space provides a striking contrast to the dark branches against a white wall, creating a memorable photo. As you head into the West Building, here&apos;s a great spot for a symmetrical shot. "Either take a photo when you enter the hallway or have one person stand in the middle and take a picture of them reflecting off of every surface,” says Emily. Discover many more great photo opps at the museum, including new art in the Museum Park recently added as part of its recent expansion! Loop us into the action by tagging your photos with #visitRaleigh.